investigatelance.org | INVESTIGATE LANCE ARMSTRONG FOR DOPING AND LYING UNDER OATH IN THE SCA PROMOTIONS TRIAL. Presented with minimal comment -- Byron at Bike Hugger forwarded a new site called investigatelance.org, that urges Congress to open an investigation into whether 7-time Tour winner Lance Armstrong lied under oath at the SCA Promotions lawsuit (some background from Outside Online here). Who's behind the website? I can't tell -- it's been registered through an outfit that anonymizes domain registrations -- but it's interesting the site went live just a week after the Trek/LeMond split and references the SCA Promotions suit, where Greg and Kathy LeMond both testified (as did Betsy Andreu) against Armstrong, who won the suit, and received the $2.5 million bonus at issue. 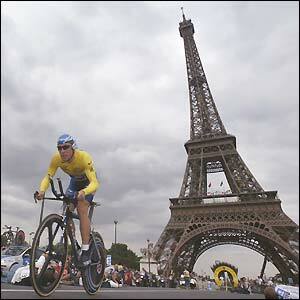 Lance Armstrong will be attending Saturday's individual time trial and Sunday's race into Paris. Discovery Channel currently has riders in 1st, 3rd, and 8th, and leads the team competition and the white jersey competition. A dose of publicity from the team's co-owner, the 7-time Tour champion, could also help land a new sponsor. Discovery Channel's sponsorship runs only through the end of the season. Most of us have noticed the physical similarities between Lance Armstrong's ex-wife, Kristin, and his ex-fiancee, Sheryl Crow. TMZ.com notes that the pattern continues with Armstrong's latest girlfriend, designer Tory Burch. TMZ doesn't mention the, um, more Freudian aspect of the story -- Armstrong's mother, Linda Armstrong Kelly. Sheryl Crow and Lance Armstrong have gone to some lengths to deny the pair are back together, after Crow stayed in the same hotel in Solvang during a visit with the Discovery Channel squad last week. Landis vs. Lance in Leadville? According to the linked PR Newswire release, Floyd Landis has accepted an invitation to race at the Leadville Trail 100, a 100-mile mountain bike race in Colorado in August 2007. 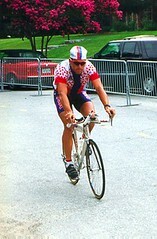 Landis raced mountain bikes until 1998. His hip resurfacing, in mid-September, went well, and he's been back on the bike, including at a charity event on Sunday remembering his father-in-law and five firefighters who died fighting the Esperanza fire in October. 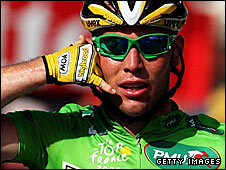 Former Tour de France winner Lance Armstrong has already committed to the 2007 edition of the race. If the release is on the level, and Landis hasn't been cleared of pending dope charges and resumed road racing, it would be Landis's first race since the 2006 Tour. It would certainly pump up interest in the race to have two former Tour winners fighting it out on dirt. Go Clipless was one of the first to report this rumor. Seven-time Tour champion Lance Armstrong finished his first race since retirement today, pulling on (Nike) running shoes instead of cleats at the New York City Marathon. Armstrong, who said he was looking to finish in less than 3 hours, met the goal, turning in a 2:59:36 while running alongside 3-time NYC Marathon champion Alberto Salazar and Joan Benoit Samuelson. Interest in Armstrong's first marathon led to the inclusion of a LanceCam, a dedicated camera on a press vehicle that led Armstrong along much of the course. Viewers could watch the LanceCam for $4.99 on the web. “I have never used my elbows like I had today in road racing, but there were a lot of groupies out there, a lot of roadwishers,” Samuelson said. Samuelson said the ex[h]aust from the press vehicle carrying the LanceCam also caused some problems. “It was very difficult,” she said. Armstrong finished 869th (824th among men) of around 37,000 participants. Latvia's Jelena Prokopcuka repeated as the women's champion (in 2:25:05), while Marilson Gomes dos Santos of Brazil took his first overall NYC win in 2:09:58. 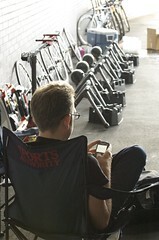 So the Lance Armstrong media machine might have thought it was permanently parked once he retired. On Tuesday, it roared out of the garage and back up to top speed. The mission? A story in the New York Times which didn't even claim Armstrong had ever used anything illegal, but quoted Frankie Andreu and another former Armstrong Tour teammate that both had used EPO while racing as pros. Armstrong also claims that a court has considered Andreu's allegations and rejected them, when Armstrong won his case against the insurance underwriters back in 2005. Obviously, that doesn't cover Andreu's claim that he used EPO; presumably Armstrong isn't denying that Andreu's admission is for real. A.J. Smith, of Ft. Lauderdale, FL, won the right to race at the US Pro championships September 1, by leading the 25-34 age group at Discovery Channel's “Race to Replace” Lance Armstrong at Indianapolis Motor Speedway on Saturday. Smith did 10 laps of the Brickyard in 52:42.4, an average of nearly 28.5 MPH. Smith and 364 other riders rode in the competitive half of the day, while perhaps 1,000 riders took the opportunity to do a “Lap with Lance.” Crowds were somewhat smaller than expected at the home of the Indy 500, where Armstrong drove the pace car in May. The event raised money for the Indiana University Cancer Center and the Lance Armstrong Foundation. Iowa's Tim O'Brien proposed to his girlfriend, Chris Gade, during the event. Some commentators had suggested the mass-start Race to Replace would lead to total carnage, or that a rider selected through such a race might be dangerous at the US Pro Championships in Greenville, SC, next month, but there were no incidents reported on Saturday. Travel day today, so I'll be slow to approve comments, but I wanted to point out a couple of things from Landis on “Larry King Live” last night. Maybe we need to come up with a different word than “suspended,” but it seems to me that if you can't race, and face possible dismissal, you've been suspended. Landis wouldn't cop to that -- he said something like that he had voluntarily stopped racing until this was cleared up -- but I believe UCI regs prohibit him from racing until then. Landis hadn't yet approved the B-sample test, but he said that was just a matter of trying to work out his options, and to find an appropriate expert to be his representative, and that he expected to notify USA Cyling later Friday night or this morning. Dr. Brent Kay is Landis's doctor, board-certified in sports medicine and internal medicine. He said it's “crazy to think a Tour de France rider would be using testosterone in the middle of the race ... It's a joke.” A member of WADA has pretty much said the same thing. Landis said he was tested 6 times before Stage 17 (I've also heard him say 5 times), but that he isn't provided with results from negative tests, so he's not sure what his TE ratios or other values were on any of those. Looks like the offensive may be working -- the Today show just teased the story without using the word “dope” (they used “cheating” instead). 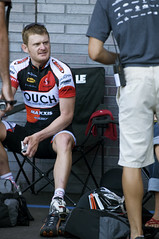 The incredible comeback ride by Floyd Landis during Stage 17 also brought back OLN's drooping ratings. Live viewership of Stage 17 was 77 percent higher than the battle on l'Alpe d'Huez the previous day. Overall viewership on the day rose 50 percent to 1.3 million for the day. Through the balance of the race, the numbers stayed up, with viewership among men in three key demographics up by more than 90 percent. The 2005 Tour, Lance Armstrong's last, averaged 1.6 million combined viewers per day, with an OLN-record 1.7 million tuning in for live coverage of the race's final stage. In my opinion, Landis doesn't want to go back to Discovery. I think he would be concerned about going back into Armstrong's shadow. Even retired, Armstrong is everywhere, making pronouncements to reporters from the top of l'Alpe d'Huez and the Hotel Crillon, publicly mending fences with Jean-Marie Leblanc, riding RAGBRAI, hosting the ESPYs. I think that tactically, Discovery would have provided better support than Phonak for Landis, but I also suspect that if Landis stays with the team, iShares will want to protect their investment by signing a few strong support riders to bolster the returning Phonak squad. His ride on Thursday was epic. He showed a champion's resolve. I look forward to seeing him up on the podium in Paris. If it couldn't be one of my guys from Discovery Channel, th[e]n I am thrilled to see Floyd continue the success of American cycling. 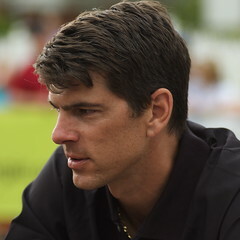 Daniel Coyle will be live on Gather.com on Friday, July 14, 2006, from 2-4pm ET to discuss Floyd Landis in yellow, his recent feature articles about Floyd in the NYTimes and Outside Magazine, and his bestselling book, Lance Armstrong's War. Last night was the taping of the ESPN ESPY awards, where Lance Armstrong served as master of ceremonies. Billy Crystal he apparently wasn't, mostly relying on cheap Brokeback Mountain jokes at the expense of Jake Gyllenhall, with whom Armstrong recently went cycling. 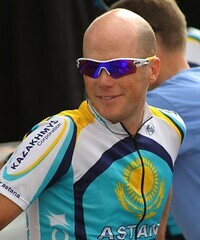 Armstrong won the ESPY for male athlete of the year, his 4th consecutive win in the category. The awards will be broadcast Sunday night, of course on ESPN, at 9 pm Eastern. ESPN says it tabulated 12.1 million online votes in the competition. The New York Times looks at early ratings for OLN's Tour coverage, and we can now quantify the Lance Effect. So far, it's 50 percent. OLN's ratings are down just about 50 percent in a Tour that's already had an American leader, but which hasn't yet hit the mountains, where it seems like more viewers might tune in for longer time periods, boosting ratings. It's also worth noting that even at the current levels, that represents about a 20 percent gain on OLN's coverage in 2002, with 207,544 average viewers in 2006 against 171,975 in 2002. Lance Armstrong is dropping his defamation suits in France against publishers of “LA Confidential: The Secrets of Lance Armstrong,” the 2004 title that quoted a variety of Armstrong's former teammates and support staff who claimed they had seen evidence the 7-time Tour winner used performance-enhancing substances. Armstrong last week won a preliminary round in the case against the UK's The Sunday Times, and subsequently the sides settled the case. Armstrong's French lawyers say they've dropped the case because of that decision, the Vrijman report of earlier this year, and the February decision that an insurance company couldn't deny Armstrong a $5 million bonus for winning a 6th Tour de France. “Mr. Armstrong considers that his honor and reputation have been re-established for all people who examine the facts in good faith, and that no further purpose is served now in pursuing other actions in defamation,” the lawyers' statement said. Had the case gone forward, the defense lawyers would likely have had to try to make the case that Armstrong used performance enhancers, since truth is an effective defense against defamation.